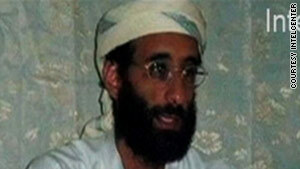 The U.S.-born Al-Awlaki, who once preached at a mosque in Virginia, is believed to be a senior Al Qaeda leader in Yemen. (CNN) -- A Yemeni court sentenced in absentia U.S.-born militant cleric Anwar al-Awlaki to 10 years in prison Monday for charges of inciting to kill foreigners, the state-run SABA news agency reported. Prosecutors charged al-Awlaki and two others with "forming an armed gang" to target foreign officers and law enforcement in November, as authorities said they were stepping up efforts to locate him in Yemen. Western intelligence officials believe al-Awlaki is a senior leader of al Qaeda's branch in Yemen, which claimed responsibility for the attempt to ship explosives into the United States via cargo planes late last year. The Yemeni court also issued a death sentence Monday for Hisham Asim, a 19-year-old that prosecutors said al-Awlaki incited to kill a Frenchman in an October shooting rampage, Saba reported. Anwar al-Awlaki's cousin, Othman al-Awlaki, was sentenced to eight years in prison -- also in absentia on charges of inciting to kill foreigners, SABA said. U.S. officials say Anwar al-Awlaki helped recruit Umar Farouk AbdulMutallab, the Nigerian man charged with trying to blow up a transatlantic flight as it landed in Detroit, Michigan, on December 25, 2009. The militant cleric is also said to have exchanged e-mails with accused Fort Hood shooter Maj. Nidal Hassan. Born in the state of New Mexico, Anwar al-Awlaki preached at a mosque in Virginia before leaving the United States. In November a senior Yemeni government official said Yemeni authorities were intensifying operations to capture Anwar al-Awlaki. The official, who spoke on the condition of anonymity because he was not authorized to speak to the media, said security forces and local tribesmen had embarked on counterterrorism operations in Shabwa Province, the homeland of the Awalik -- Anwar al-Awlaki's tribe. Last year YouTube removed "a significant number" of video clips it found to be inciting violence, many featuring al-Awlaki. Attorneys for al-Awlaki's father, Dr. Nasser al-Awlaki, tried to persuade U.S. District Court Judge John Bates in Washington to issue an injunction last year preventing the government from the targeted killing of al-Awlaki in Yemen. But Bates dismissed the case in December, ruling that Nasser al-Awlaki did not have standing to sue. In a November hearing, lawyers for the U.S. government refused to confirm that the cleric was on a secret "kill list" or that such a list even exists. CNN's Mohammed Jamjoom contributed to this report.